(Bloomberg) -- General Motors Co. overtook Toyota Motor Corp. as the more profitable automaker this year, while Ford Motor Co. held its lead as the world's top-earning manufacturer amid rising global sales for the industry. GM reported third-quarter net income of $2.16 billion today, bringing the automaker's earnings this year to $4.77 billion. That tops the $4.46 billion profit by Toyota in the nine months ended Sept. 30, according to data compiled by Bloomberg. The industry is benefitting from global sales that may surpass 70 million vehicles this year, according to estimates by IHS Automotive and J.D. Power & Associates. Automakers restructured during the global recession by cutting brands, closing factories and firing workers, positioning themselves for higher profit as demand returned. 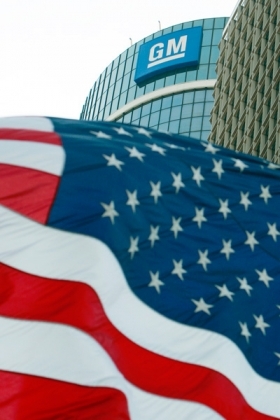 Ford has earned $6.37 billion this year, already more than doubling its full 2009 profit of $2.72 billion. Ford's new Fiesta subcompact and Super Duty versions of its pickups are selling for higher prices and helped boost the company's U.S. market share by 1.5 percentage points through October, according to Autodata Corp. The turnaround engineered by CEO Alan Mulally after losses of $30 billion in 2006 through 2008 has allowed Ford to pay down $10.8 billion in obligations this year and reduce its auto unit's debt to $22.8 billion. Honda Motor Co. has the second-biggest profit this year, with $5.34 billion in earnings. Bloomberg used net income in U.S. dollars for the nine months ended Sept. 30 for comparisons. Honda and Toyota forecast weaker earnings in the second half of their April-to-March fiscal year as the yen's strength against the dollar reduces the value of overseas earnings. Germany's Volkswagen AG was the third most-profitable, with net income of $4.9 billion. Daimler AG earned $4.49 billion on demand for the E- and S-class sedans in China and the United States. Toyota came in at sixth place after recalling about 15 million vehicles globally in the past year amid reports of unintended acceleration. The recalls, including more than 5.4 million in the United States this year, have put Toyota on pace to fall behind both GM and Ford in sales in the world's second-largest auto market. Toyota lost 1.5 percentage points of market share through October, according to Autodata. Global light-vehicle sales may rise to 71.1 million vehicles, according to J.D. Power. The previous record was 70.3 million units in 2007, J.D. Power said. Global light-vehicle sales will increase 6 percent to 73.8 million next year, IHS Automotive said in September. The forecast assumes 1.95 million additional deliveries in China and South Asia and a 1.5 million increase in North American sales. “Our expectation is that Europe will slowly rebound and North America will have some incremental increase in volume, but it's still a China and India story,” Michael Robinet, an IHS Automotive analyst, said today in a telephone interview. GM, seeking to raise as much as $10.6 billion in an initial public offering next week, has the “best of both worlds” in its position in North America and developing markets, said CFO Chris Liddell. GM has the top share in North America and top consolidated share in Brazil, Russia, India and China, Liddell said in a presentation to potential investors. The company's European operations continue to drag on profitability, losing $1.2 billion before interest and taxes so far this year. In its release, and in an online presentation to analysts and media, GM cited net income "attributable to common stockholders" of $1.96 billion. The figure used in this story is the $2.16 billion in net income "attributable to stockholders." The difference: $203 million in cumulative dividends on preferred stock. GM's IPO, scheduled for Nov. 17, seeks to reduce the U.S. Treasury Department's ownership to 43 percent from 61 percent. The department bought the stake as part of the company's bankruptcy in 2009. Mulally, 65, has said Ford will deliver “solid profits” this year and that 2011 results will be even better. Ford may have net income of $8.55 billion in 2011, the average estimate of nine analysts surveyed by Bloomberg. Volkswagen's earnings before interest and taxes and its revenue “will continue to develop positively” as customers in China, its largest market, buy Santana and Lavida sedans, the company said Oct. 27. Daimler raised its 2010 profit forecast to more than 7 billion euros ($9.62 billion) on Oct. 28. While GM will have positive earnings before interest and taxes in the fourth quarter, they will be “significantly lower” than the run rate in the first three quarters of the year, CEO Dan Akerson said today on a conference call. The company said in a filing last week that it will build a different mix of vehicles and that engineering costs for future models will be higher. GM is introducing the Chevrolet Volt gasoline-electric car and Chevy Cruze compact during the quarter.